Prada Infusion d’Iris Perfume. What is it about Prada that everyone just seems to want? From top of the line handbags to shoes that the fashion forward covets, it seems that the name Prada simply drips of sophistication and class. If you’re like many others, then you know how much Prada products represent simple, clean, design forward quality and you probably have seen something that you would like to have with the Prada name on it. 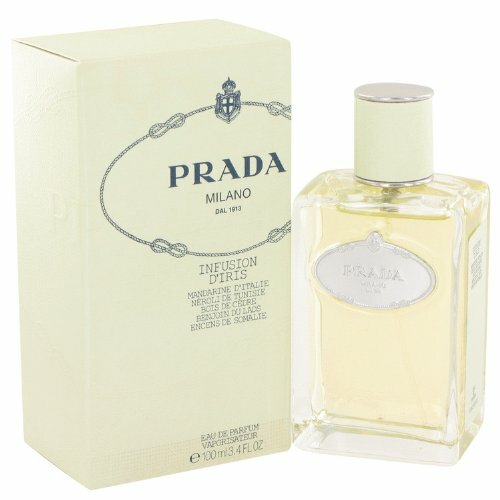 The same can be said of the Prada line of fragrances, and especially of Prada Infusion d’Iris Perfume. Prada perfumeries only use the finest all natural ingredients, which gives their fragrances a fresher, longer lasting body than other perfumes. Prada Infusion d’Iris perfume has the same high quality natural ingredients and is named for the ancient six month long process of infusion to get the most fragrant oils of the iris. Launched in 2007, this fragrance has held it’s own in popularity and reviewers say that they will continue to purchase this fragrance. With a heart of iris, this perfume contains top notes of mandarin, orange and orange blossom combined with galbanum and a base of cedar and vetiver to give Prada Infusion d’Iris perfume a fresh, elegant and sophisticated fragrance that you will love to wear over and over again. It is packaged in a glass bottle reminiscent of what you would find in the past; this perfume is all about fresh spring mornings and the rich fragrances of flowers in bloom. If you love other Prada perfumes and love the quality of this find perfumery, then you will definitely be thrilled by Prada Infusion d’Iris perfume and the floral, slightly woodsy notes of this fragrance. Romantic and soft, with a very distinct fragrance, when you wear this fragrance, you will leave people wondering what you are wearing and how they can get some. When you wear perfume, the idea isn’t to smell as if you dipped yourself into a fragrance, but rather, to smell as if you are made of that fragrance. Good quality perfumes will drift off you in a way that not many fragrances can, but you will find your Prada Infusion d’Iris perfume does just this. If you want to feel as if you naturally smell good and you are looking for a signature scent that you can wear all the time and it will never get old, then you should consider the quality of Prada perfumes. For some, this fragrance is too light, but for others, its gentle complexity and light sexiness are just enough to keep you buying this fragrance again and again. Reviewers report that they are pleased with the way this Prada Infusion d’Iris perfume adds a soft, elegant fragrance without making you feel as if you’re being attacked by the scent. While this perfume does cost slightly more than other designer fragrances, it is true Prada quality all wrapped up in a beautiful package. Always remember that different fragrances react differently to different body chemistries, so you should sample the scent before you buy to make sure that you will be pleased with the smell. We do not sell knockout products. So no worries about the authenticity.